Your Gums and Your Heart - What's the Connection? Home Medical Care Your Gums and Your Heart – What’s the Connection? Your Gums and Your Heart – What’s the Connection? How could periodontal disease possibly be connected to coronary disease and stroke? The answer is inflammation. Amazingly, there is an intimate connection! Studies have shown that periodontal disease increases your risk of coronary heart disease by 50%, fatal coronary disease by 90%, and stroke by 180%! How does that happen? When the dental hygienist pokes your gums with a sharp needle she is looking for inflammation. If the gums (or gingiva in dentistrese) are inflamed they become soft and squishy because the inflammtory process allows plasma to escape from the blood vessels surrounding the tooth. The increased permeability is the result of white cells congregating at the site and doing what they are supposed to do: releasing inflammatory mediators, such as interleukins, TNFα. The unvarnished truth is that our collective mouth is foul. And that’s not because we use foul language but because it is colonized with billions of bacteria. In fact, over 500 species make their home in the oral cavity, many of them are of the gram-negative type. These are the bacteria that inhabit, sorry for the unappetizing subject matter, foul-smelling abscesses. As true believers in natural selection we might wonder: wouldn’t some defense against those bugs confer a selective advantage? Researchers observed monkeys and apes use small sticks they break off a tree as tooth-picks. 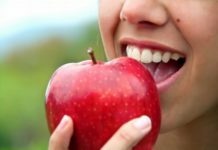 Since they never heard of oral hygiene this behavioral pattern must have been transmitted from one generation to the next beecause some ancient ancestors observied that they could chew food a lot longer, and hence live longer, if they cleaned their teeth. same is true for some isolated tribes in the Amazon basin: they clean their teeth with toothbrushes fashioned out of plants. Still, why is it that the older a person is the more dental problems he or she may have? Why is gum and bone loss an old person’s affliction? Now we are getting to the interesting science of the mouth (are you excited yet?). When the dental hygienist pokes your gums with a sharp needle she is looking for inflammation. If the gums (or gingiva in dentistrese) are inflamed they become soft and squishy because the inflammtory process allows plasma to escape from the blood vessels surrounding the tooth. The increased permeability is the result of white cells (neutrophils) congregating at the site and doing what they are supposed to do: releasing inflammatory mediators, such as interleukins and TNFα. Mehmet Eskan and his colleagues in London college, in collaboration with groups in the U.S., reveal that the deterioration in gum health which often occurs with increasing age is associated with a drop in the level of a peptide called Del-1. This peptide inhibits the inflammatory activity of IL-17, an interleukin. So when DL-1 levels drop, IL-17 runs amok and the ensuing inflammation basically dissolves the gum tissue and the underlying bone, in which the tooth is embedded. Result: toothless older people. The curious phenomenon of older people developing gum and bone disease, whereas younger ones having the same bacterial flora, the same inflammatory response to gingival bacterial colonization, by and large escape with little damage, was not well understood. The facile explanation was “wear and tear”; the oral tissue “got worn down”, too tired to fight back. This is the first time that a rational explanation backed by data is offered. Now scientists can embark on a rational search for drugs that would either stimulate DL-1 production or mimic its action. We marvel at the connectedness of everything alive. How could periodontal disease be possibly connected to coronary disease and stroke? The answer was: inflammation. This is true as far as it goes, but it doesn’t tell us specifically how. Now we know that poetic-sounding concepts such as “everything is connected” do not need to remain metaphysical; they have a rational molecular basis. Not much different from what we have been doing: floss, brush at least twice a day, avoid sweets, don’t smoke, and visit your dentist twice a year for preventive care.